Before upgrading a running server to the latest version of Newscoop, it is strongly recommended that you back up your publication database, theme templates, images, file attachments and configuration files. First, log in to the administration interface (see the Getting started chapter in this manual for details). Click on Actions in the main navigation menu. At the lower end of this sub-menu, click Backup/Restore. 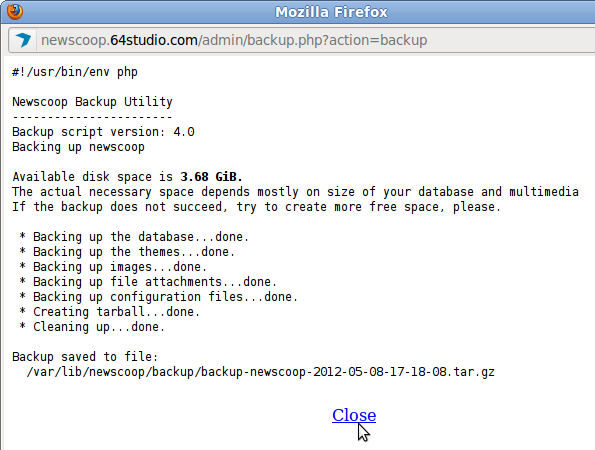 To restore from a previous backup file into another Newscoop system, click the Upload backup file link, and then select the backup from your desktop computer's file system. Then, click the life preserver icon to restore from one of the listed backups. You will be warned that current publication and theme data will be overwritten by versions in the backup file, so you should make sure you have a backup of current data before continuing. Newscoop includes two scripts that can be used for backup and restore on the command line of your server. They are found in the bin/ subdirectory of your Newscoop installation, such as /var/lib/newscoop/bin/ or a similar location. Because these scripts require access to your Newscoop configuration files, they must be run as the root user (with sudo on Ubuntu). After you have completed the backup successfully, update your Newscoop installation using either the automated or manual methods described in the following chapters. 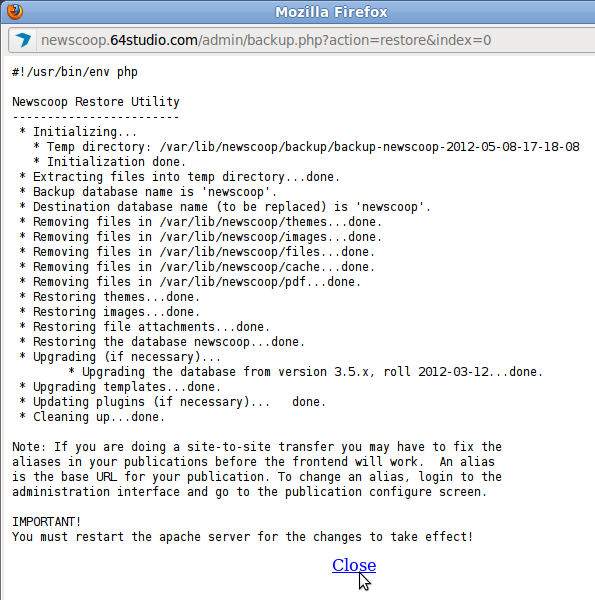 If using the manual installation method for an upgrade, the existing files in the Apache DocumentRoot folder (such as /var/lib/newscoop/) should not be removed first, unless you wish to perform a clean install. Any changes that you have made to the sample themes supplied with Newscoop will be overwritten on upgrade. For this reason, you should rename the theme in the theme.xml file before upgrade, if you wish to keep those changes. See the Newscoop Cookbook technical manual for more details on how to create themes. When the new files are copied over the existing Newscoop installation, your publications will automatically be taken offline, and a maintenance message will be displayed to your readers. Once the upgrade is complete, your publications will automatically be put back online.